The Rant provides all the features of a high-end park board in a smaller grom-sized package. The best park style board available for the kids features great rebound and response and a lively feel! The all wood core is designed uniquely for the smaller rider, profiled to flex and react as intended. The Grind base and Liquid Rails set this board up to take a beating and keep coming back for more. Check out the Rant for your grom who prefers to take life at full speed! 18"-22"/45.7 cm-55.9 cm. This product is considered to have what is known as a "cosmetic blemish". The minor cosmetic imperfection does not affect the structural integrity of the product nor will it alter the overall performance in any way. Grind Base Get the strongest base possible while maintaining the performance features of each finely tuned hull shape. 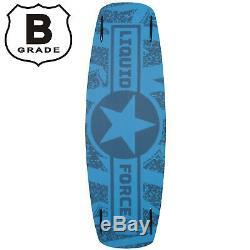 Liquid Force's Grind Base molds to the board's contours and provides solid protection all season long. Liquid Rail LF's elastomeric sidewalls deliver unsurpassed durability and strength for your endless cable park progression. This material moves with your board as it flexes and keeps it together through every hit and rail you can dish out. Full wood core uniquely profiled for groms. The item "Liquid Force 2017 Rant 125 BLEM Kid's Wakeboard" is in sale since Friday, January 19, 2018. This item is in the category "Sporting Goods\Water Sports\Wakeboarding & Waterskiing\Wakeboards". The seller is "ambushboardingco" and is located in Kennesaw, Georgia.